Spaghetti squash holds a firm spot on my list of top-five favorite vegetables! While it doesn’t offer much in terms of color or flavor, and it certainly isn’t the most nutrient dense item of the vegetable world, it is THE MOST VERSATILE. It makes for the perfect base for just about every meal imaginable – for more on that, check out our Tutorial Thursday post all about spaghetti squashes. Chelsea, blogger behind Do You Even Paleo, shares our appreciation for all things spaghetti squash and created a recipe that we can’t wait to recreate at home ASAP! I mean, you can’t ever go wrong when you pair spaghetti squash with another favorite – – bacon! 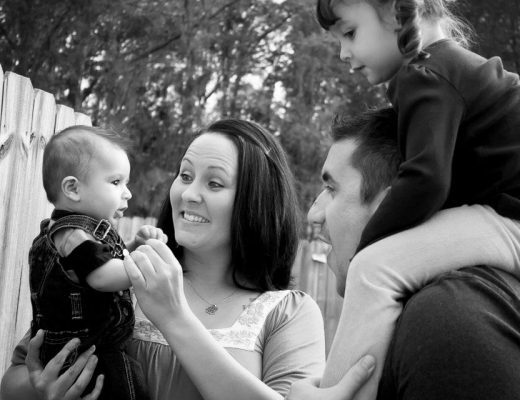 WOW, it feels totally surreal to be guest posting at the Paleo Parents blog! I’m sure I’m not the first guest poster to say that…but I want to give a shoutout to Stacy and Matt for recognizing greatness when they see it. Just kidding – in all seriousness, I’m 110% humbled to be asked to post on this wonderful and influential blog! 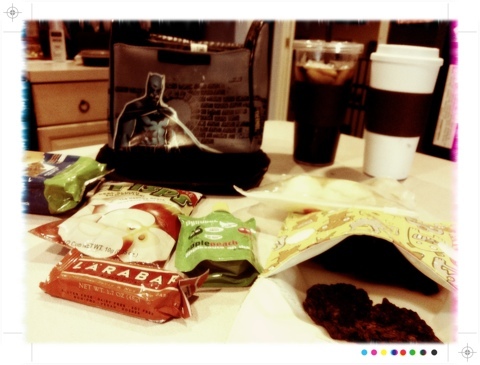 On to the food, which is the real reason you’re here. If you’ve seen my blog before, you probably know that I’m a huge fan of exceedingly simple recipes – food that’s easy to make or uses a handful of ingredients, but tastes incredible. Sometimes it seems as though food bloggers are out to make the most complicated of dishes to uniquely stand out from the multitudes of recipes online. That’s totally fine, but it makes good food look time- and labor-intensive…when really, good food can be simple. 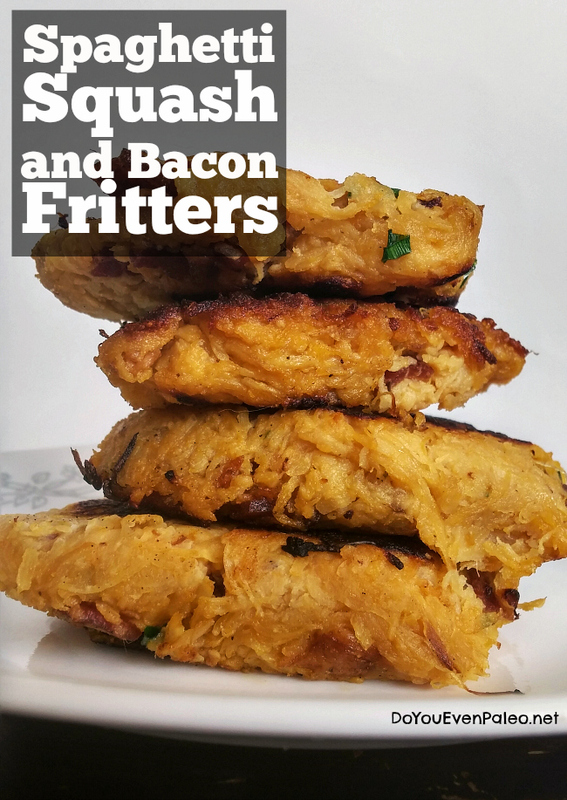 I had that in mind when I came up with these spaghetti squash and bacon fritters. I simply combined flavors that I enjoy and fried them up into adorable and delicious little patties! The biggest nuisance of this recipe is squeezing the moisture out of the spaghetti squash. If you don’t get enough moisture out, the fritters won’t stay together well – if at all. You can definitely get adequate moisture out by squeezing the cooked and cooled squash over a colander with paper towels or your bare hands, but for me, that took a while. Not only do I lack patience, but asking people to stand over their sink squeezing spaghetti squash for 30 minutes did not seem to align with the “simple recipes” I’m all about. As a result, I almost threw out the recipe. But then, I saw Slim Palate’s method for squeezing out moisture (from zucchini), and I had one of those “why didn’t I think of that? !” moments. Nut milk bag. Not just for nut milks! Put your spaghetti squash in and squeeze the life – erm, moisture – out of it! It’s much faster than hand squeezing. Seriously, a nut milk bag is probably one of my favorite kitchen tools. So here you go. Armed with a nut milk bag, these spaghetti squash and bacon fritters will be done in a flash! Need to cook your spaghetti squash first? There’s a wonderful tutorial right here on the Paleo Parents blog! For recipes using pre-cooked bacon, I like to bake it - about 15 minutes at 400 degrees! Put cooked and cooled spaghetti squash in a bowl and lightly salt. Walk away for 10 minutes to let the salt draw out some of the moisture. Then, put the spaghetti squash in a nut milk bag and squeeze until most of the moisture is out. This step is vital – it helps prevent the fritters from falling apart. 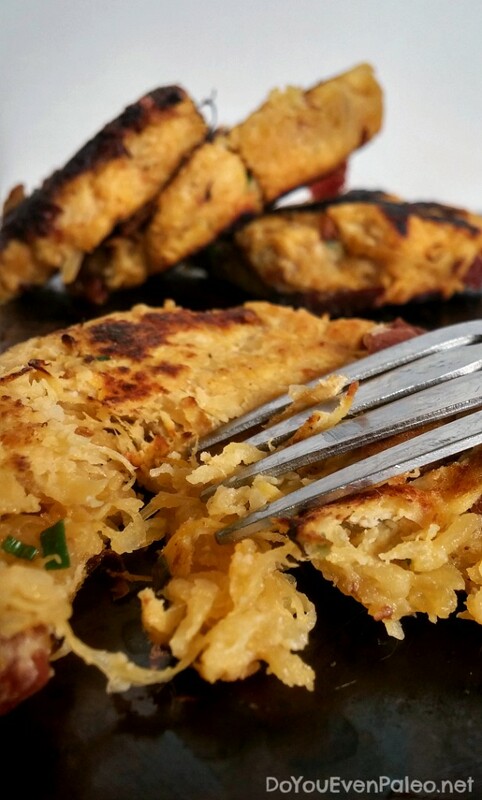 Watery spaghetti squash = mushy fritters. And that’s no fun. If you don’t have a nut milk bag, squeeze the squash with your bare hands (or paper towels) in a colander over the sink. Whisk eggs in a large bowl, then add bacon crumbles, green onions, coconut flour, salt, and pepper. Add cooked, wrung out spaghetti squash and mix everything. Add 2 or more Tbs of cooking fat of choice (ghee is also amazing here) to a skillet and heat over medium-high heat. Drop about 1/4 c of mixture at a time into skillet, quickly flattening with a fork or other utensil. Fry for 3-5 minutes on each side. NOTE: You can also bake these fritters if you choose. They won’t get the amazing crispy “crust”, but they still taste good! Preheat the oven to 350 degrees. Scoop about 1/4 c mixture onto parchment paper-lined baking sheet and flatten with a fork or back of a spoon. Cook for about 15 minutes.